Flower arrangements are a wonderful way to bring the garden indoors. Who doesn't love getting a bouquet of flowers? I truly enjoy creating with flowers. Early in the morning is the best time to cut flowers and what an enjoyable time to spend in the garden, wandering around trying to decide which flowers are in their prime. Once I've decided on the flowers, I go into the potting shed and select a container, basket or vase from an extensive collection for the chosen blooms. Just gathered and waiting to be arranged. #2 Each arrangement has it's own personality. Outdoor potting and arranging table. The last two are fall arrangements with flowers that will dry. I'd encourage you to cut some flowers, foliage, branches or anything else you find in your garden. 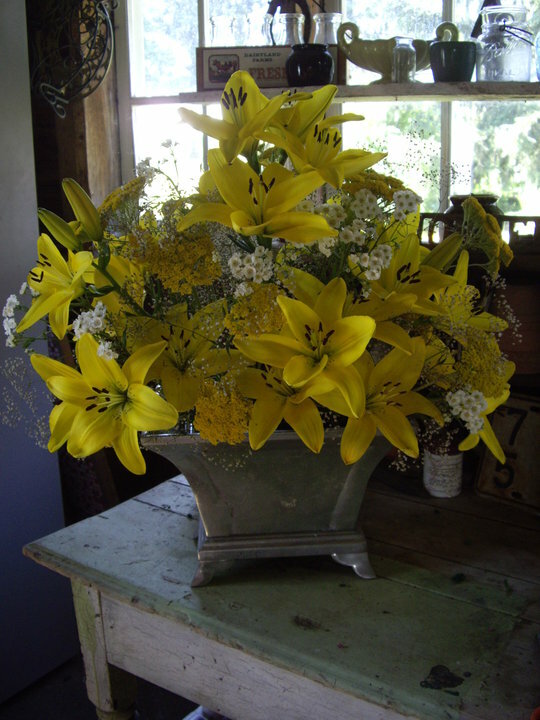 You can use just about anything in your arrangement and just about anything for the container. Get creative, bring a piece of your garden indoors and enjoy! I'd love to know which one is your favorite! If you've read "The Secret Garden" you will remember how Mary and her new friends discovered a Secret Garden and discovered what a magical place a garden and a Secret Garden at that can be. A few years ago I noticed how much my then 3 year old granddaughter loved spending time in my garden. I decided it would be just so much fun to carve out a small space for a garden of her own. I finally decided on a spot behind some tall blue spruces with some other trees on 2 sides. It seemed the perfect spot to create not just a children's garden but a Secret Garden for children. The little playhouse was built by my grandpa for my siblings and myself more than 40 years ago. There's a fairy garden that is watched over by pink flamingos. I've made a few stepping stones for the path. This butterfly is fun to decorate with sidewalk chalk. The corn, pumpkins and gourds are planted outside the Secret garden for best sun exposure. I live and enjoy life on a farm in Iowa. Gardening is one of my passions along with a variety of other interests. I am the grandmother of a gardener in the making.